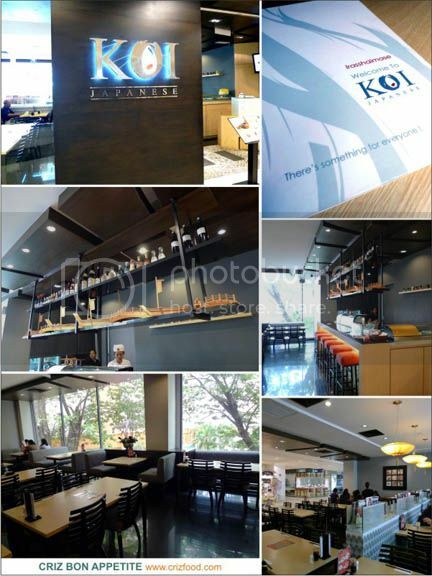 If you need something Japanese and with a touch of fusion by infusing some parts of the Western culture into the Eastern ways, then Koi Japanese would be the ideal place for you. Not only were the dishes prepared in many unique ways, they are also economical for the consumers. Thus, you won’t get your pocket burned when dining here. The design of the restaurant was simple and yet elegant enough for any crowd. I had the opportunity to pay a visit to this restaurant to try out some of their signature dishes. The first dish which was the Popeye Salad (RM18.80+) may look simple at the first glance but each mouthful was very refreshing. 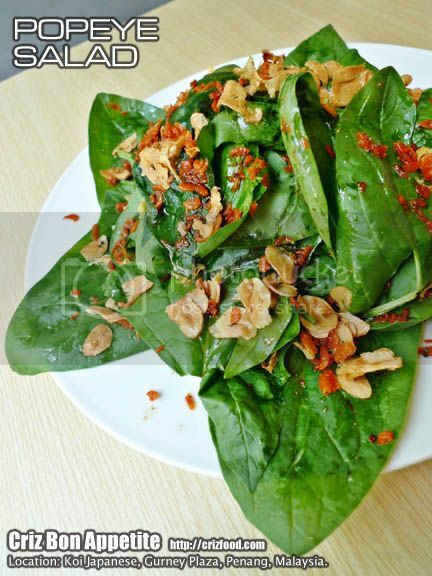 Who would have thought that just some sautéed dried shrimps and garlic in olive oil plus a mild dash of soy sauce on a big plateful of fresh Chinese spinach would have giving the overall taste such a punch? The crunchy sensation from the slightly salty dried prawns combined with the fragrance from the garlic was a great experience for me. It was indeed a perfect salad for any ages. They also serve a number of colorful and tasty signature maki with catchy names such as the Pink Sakura, Surf & Turf, Hawaii, Rock & Roll and more. What caught my attention was the Bread Crunch (RM14.80+/8pcs or RM7.80+/4pcs). The maki stood out amongst the rest as it did not contain any vinegar boosted steamed Japanese rice (sushi rice) but instead it used soft and fluffy bread. It had a piece of bread on a nori (dried seaweed sheet) rolled up with crabstick, cream cheese, ebiko (prawn roe), shredded cucumber, sweetened egg, crunchy butter toasted croutons with a light touch of mayonnaise. Each square shaped maki had some coarsely pounded cheese roasted peanuts garnished on it. I love the slightly chewy yet crunchy bite, especially with some added wasabi~ 🙂 You should not miss out this dish! 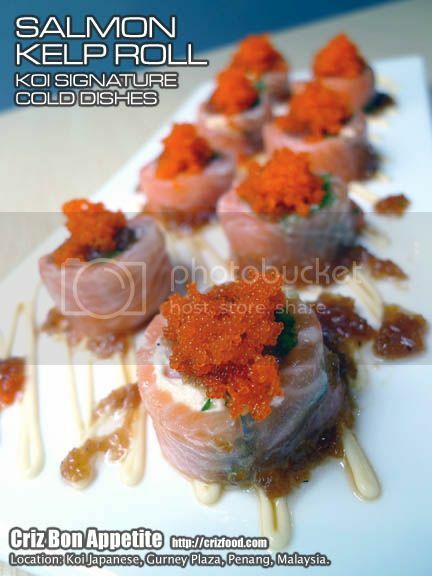 As for the Koi Signature Cold Dishes section, I tried out two of their most ordered items. 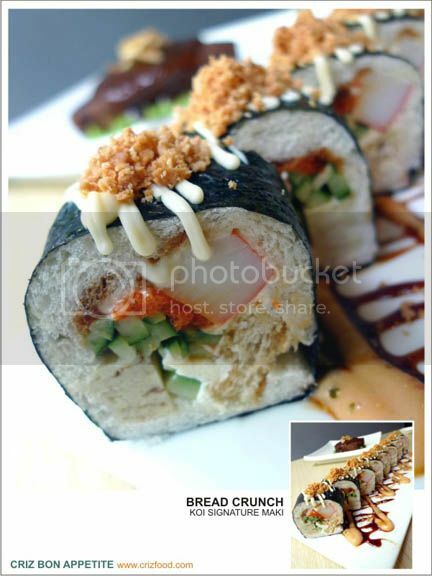 One of them was the Salmon Kelp Roll (RM24.80+/8pcs). The roll had a thinly and translucent piece of salmon wrapped with crabstick, cream cheese, chopped spring onions and garnished with some ebiko. These rolls were served on a plate with some mayonnaise and the chef’s signature dressing which had a sandy grated daikon (radish) texture plus some sweet soy sauce and vinaigrette. This would be one dish that would be worth ordering, especially when there’s the seasonal 35% discount (RM16.12+ only) until end of March 2012. 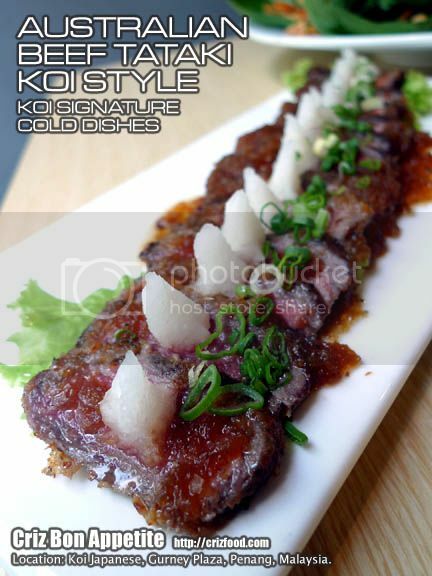 The next of the cold dish would be the Australian Beef Tataki Koi Style (RM38.80+/10slices). For non beef eater, you can have the option for tuna too. The grounded black pepper marinated Australian beef was seared to perfection and cut into thin slices, dressed with a special sauce and garnish with some chopped spring onions and grated daikon. The sauce had some hints of soy sauce, sugar, sesame oil, olive oil, rice vinegar, grated ginger and most probably with a touch of sake or rice wine as it had that mild sourness. As for the Koi Signature Hot Dishes section, I tried out the Tuna Steak (RM28.80+). 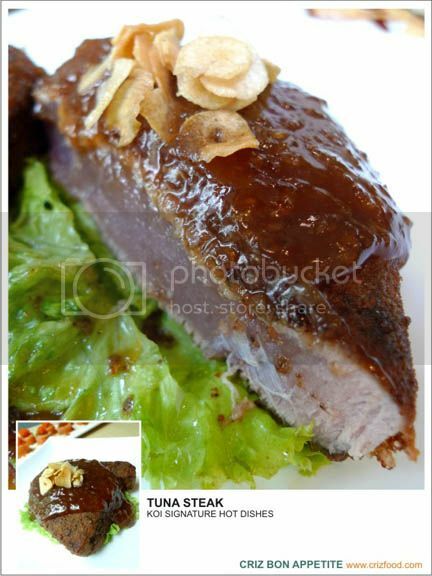 Other than having the tuna raw for my sashimi, I have yet to try out a thick slab of red tuna fillet seared medium-rare. If you like steak, you would love this meaty black pepper crusted tuna steak. It had that nice and tender rawness to my liking. From the texture of the tuna steak, I’m sure that the fish was seared for barely 2 minutes on each side. Instead of serving plain or with teriyaki sauce, this tuna steak had the chef’s signature sauce with some deep fried garlic slices garnished on it. The sauce had some apple fruity sweetness with hints from some grated ginger, shallots, garlic, radish, soy sauce, mirin sauce, miso paste and some spices. This is one of my favorite fish dishes so far. 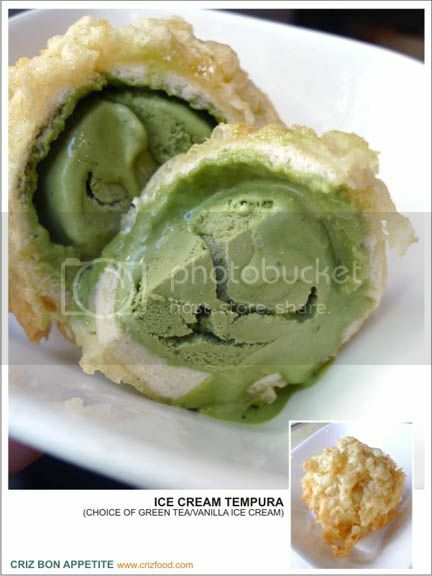 As for the desserts which were quite limited here, I opted for the Ice Cream Tempura (RM6.80+ with either green tea or vanilla ice cream). It tasted just like the fried ice cream recipe I did, except it had that extra tempura crisp. The green tea ice cream was awesome as it was homemade with a rich macha flavor. Unfortunately, the bread use was a bit on the thick side, thus not having that extra crispiness and got soiled easily by the melting ice cream. The chef should have rolled the bread flat before wrapping in order to have a more dense texture to avoid the sogginess issue. Other than that, it was still a nice hot and cold dessert. The dessert was served with a squeeze of honey. As for beverages, you can have teas, juices, sodas, floats, soft drinks, beers, sake or even sochu. I tried out the Tokyo Blue (RM5.80+) in the soda section. 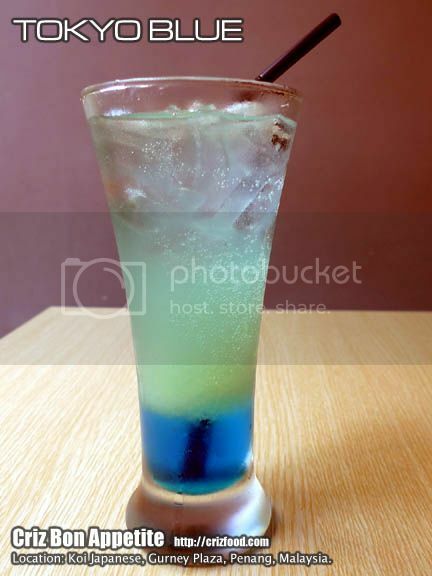 It had a concoction of blue curacao syrup and pineapple juice, jazzed up by some fizzy soda water. It was quite thirst quenching. 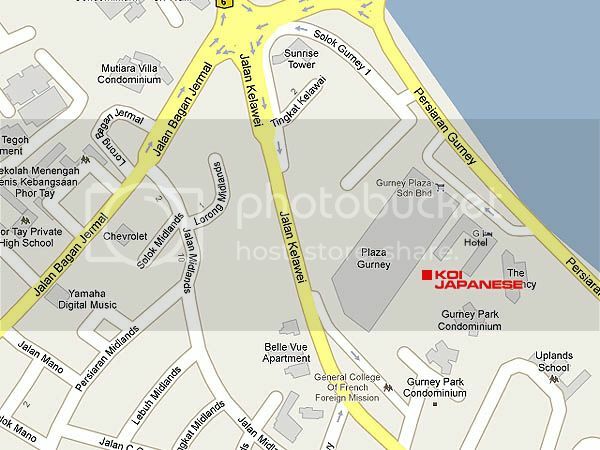 I don’t think I would need to describe the way to Koi Japanese as most people would know how to get to Gurney Plaza. Just walk towards the new wing of the mall and go to level 2, above McDonald’s and next to Sushi King.